Filipino Americans in California are wondering about real estate transactions being initiated by Filipinos on tourist visas, who are selling retirement condos in Manila as unlicensed sales agents. It may even be a case of human trafficking. The story is important because of the man whose properties are being sold. They belong to Jose E.B. Antonio, one of the richest men in the Philippines and prior to the election of Donald Trump, named the Philippines’ special envoy to Washington for trade, investment and economic affairs. Antonio also happens to be a ginormous Asian F.O.T. That would be “Friend of Trump,” but he’s actually more than that. The New York Times‘ top story headlined “World of Potential Conflict For a Developer President: Many Trump Partners Have Ties to Foreign Governments as Work Spans Globe,” actually put Antonio in the lede. 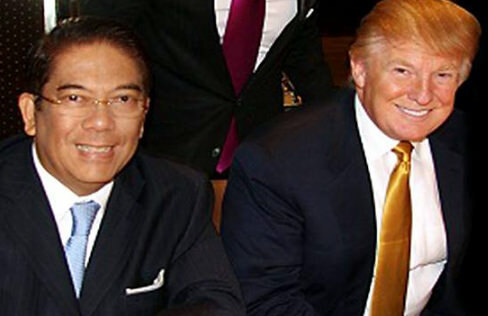 As chair of the Century Properties Group, he’s building the $150 million, 57-story high-rise on the edge of Manila’s Makati district, so tall it can be seen for miles around by the predominantly poor masses of the city. Yes, the Philippines has been branded by Trump. The ongoing questions of conflict of interest may be resolved soon, as Trump has tweeted that he’s leaving his business. We’ll see how he’s going to do all that. He’s still the envoy on business and trade to the U.S. for the Philippines. And Juvenal Castro knows how Antonio conducts business. Castro, 77, is a retired Navy officer who lives in California. Last year, Castro helped out a distant relative and three others who were visiting on tourist visas from Manila. The visas were for cultural dance performances to take place in September and October throughout California’s Filipino communities. The performances took place. But the dancers’ main job wasn’t to move to the music. It was to sell Antonio’s real estate, a violation of their visa. The smallish condos were being sold for anywhere from 10-15 million pesos. 15 million pesos, at 46 pesos per $US dollar. That’s $326,000, an alluring price for a middle-class Filipino American looking for a cheap retirement. They understood sales though. They went to places where Filipinos gathered in malls and restaurants, and Castro said he saw white boards of their activity, amassing a figure near $124 million pesos in sales—$2.7 million during their time. The California Bureau of Real Estate confirmed it is against the law for foreigners to solicit for foreign properties on U.S. soil without a California license. But it may also be a case of human trafficking, says Maria Elizabeth Embry, a Northern California anti-trafficking advocate. She said the visitor visas arranged by Mr. JoJo Quiroz, the dance entrepreneur, and by Antonio’s Century Properties brought 16 Filipino citizens to the U.S., and they were forced to work long hours by companies seeking to skirt labor laws. Embry has written an open letter to President Duterte of the Philippines asking for an investigation of Antonio’s business practices of deploying Filipinos to sell properties without a license in the U.S.
“The appointment of Mr. Antonio to a position giving him diplomatic immunity is nothing but a disgrace to the local and international diplomatic community,” Embry wrote. President Duterte has not responded. I attempted to reach both Antonio and Quiroz and have yet to hear back. While Antonio is the head of Century Properties in the Philippines, Quiroz does appear to be a licensed real estate agent in California. Still, the initial solicitors brought in from the Philippines on visitor visas were neither authorized to work nor licensed to sell real estate in California. That would be a violation, and if fraud or widespread misrepresentation about the properties were involved, the California Bureau of Real Estate said it could refer the matter to law enforcement for possible criminal action. For now, Juvenal Castro, who housed four of the sellers in his spare bedroom for a few months, said most of the dancers moved on. Some went to New York and New Jersey, and some have since returned to the Philippines. He doesn’t know if anyone on the east coast, lured by the Trump brand, was sold any properties. But this is a case of stinky fish–it goes to the head. That would be Jose E.B. Antonio, who remains a special envoy to the U.S., and a big F.O.T.